Manmade structures built along Chesapeake Bay shorelines to protect against sea-level rise, storm surge and erosion have been found to negatively impact waterbirds, according to a USGS study. In many coastal regions, shorelines are “armored” with wooden, concrete or steel bulkhead walls or riprap borders that consist of piles of large stones or boulders. Shoreline armoring, however, can result in habitat loss and changes in food availability for many native coastal species as well as contribute to the spread of invasive species. USGS scientists looked at impacts to waterbirds, which include ducks, geese, shorebirds, marsh birds, seabirds and wading birds. 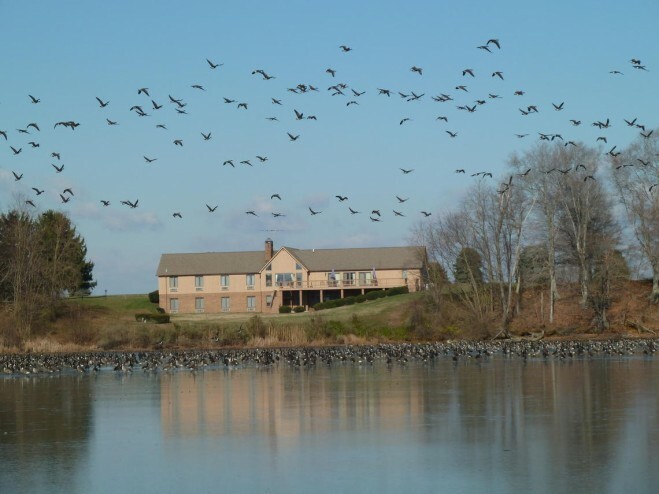 Waterbirds can be indicators of overall ecosystem health, and, when they are at the top of the food chain, as they are in the Chesapeake Bay, their declining numbers can cause cascading effects throughout the rest of the chain. “This research will help managers make informed decisions to preserve critical species and ecosystem functions while also protecting against sea-level rise,” said USGS biologist Diann Prosser, who is the lead researcher on this study.